At approximately 9 a.m., officers responded to a report of a burglary in progress at a home on the 1400 block of Strawberry Avenue and found someone had forced their way into the unoccupied residence. 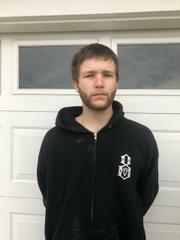 While searching the home, officers found a 23-year-old Oceano man hiding inside the garage. Trey Anthony Wilson was in possession a stolen firearm, a dagger, narcotics and drug paraphernalia. Police booked Wilson into the San Luis Obispo County Jail for possession of a firearm by an addict, possession of a dirk or dagger, possession of a controlled substance, possession of drug paraphernalia and trespassing. Neighborhood youth that went to school with him are saying that this house was unoccupied because this is a vacation home for the owners and Trey knew this. They say he was using it as a “crash pad” because he has no where else to stay. That is what the rumor is anyway. He should be prosecuted for being an idiot in possession of a firearm and drugs. If you know Trey Wilson like I do, then you know he is a hopeless druggie.